Employee Assistance Programs Blog: America's First and #1 EAP Blog*: Helping Employees with a Wage Garnishment "Fishing Net"
Helping Employees with a Wage Garnishment "Fishing Net"
Garnishments are court orders for the employer to cut a check, mail it to the creditor or entitled party, and along with it process a bunch of paper work every pay period, sometimes for a long period of time. Employers must follow court orders to garnish wages or face paying the entire amount to the creditor themselves. They are a nuance for any hard-working payroll department and they cost the company money. EAP utilization can be boosted dramatically if you make arrangements with your organization to have management make supervisor referrals for employees whose wages must be garnished. The performance basis of the referral is the financial burden on the organization resulting from issues within the employee’s personal life adversely affecting the workplace. Like any management or supervisor referral, the garnishment referral is not a punitive act. Wage garnishment judgments may or may not be deserved sometimes, but they are almost always symptoms of larger problems in the employee’s life in addition to the debt and credit problems the employee is experiencing. That’s because psychosocial problems frequently produce financial problems. Garnishments could be symptoms of drug problems, marital crisis, depression and mental illness, and of course, compulsive shopping or gambling. It isn’t easy to arrive at the point where one’s wages are finally garnished. Many threatening letters, phone calls from creditors, and the like arrive first. A year or two could pass before a court case becomes a garnishment judgement. 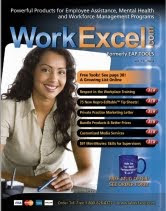 Most organizations have considered referring employees with garnishments to the EAP, although historically such referrals were commonplace among core technology EAPs of the past. Breathe new life into your utilization rate. Set a meeting date with human resources and discuss the practice of employees being referred to the EAP as a result of wage garnishments. There are many ways to do it—from a simply mention in a letter, to a more formal management referral. 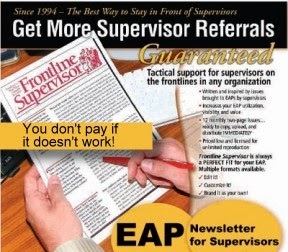 Like any supervisor or management referral, be supportive when making employee wage garnishment referrals to the EAP. 3. Get your organization to refer such employees and you'll get the business and your utilization rate up. 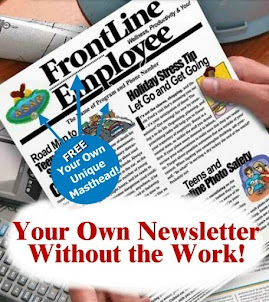 Draft a model letter for the employer(s) you serve, justify the rationale, and start getting these referrals.